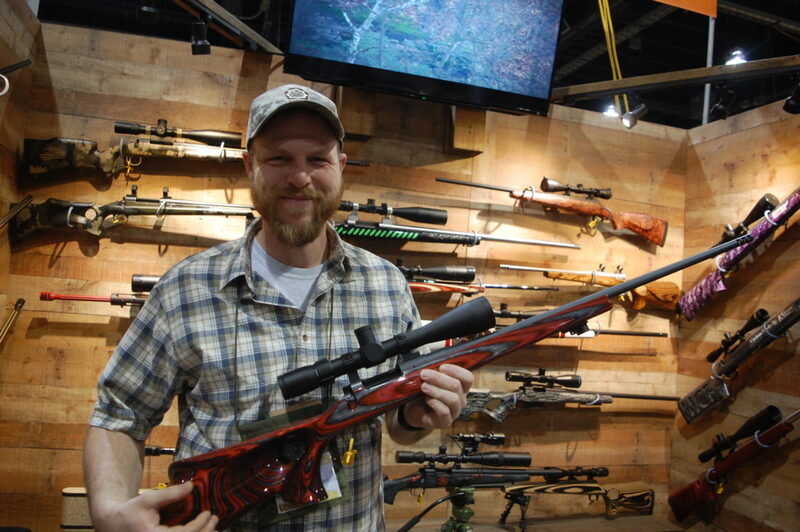 Kevin Cram, founder of Montour County Custom Rifles of Jerseytown and master rifle builder, displays one of his personal long-distance hunting rifles in his exhibit this year at the Great American Outdoor Show in Harrisburg. HARRISBURG — Life can be good for the hunter who has stockpiled his preference points, selected the dates and made the final payment with an outfitter for what will be the most anticipated Western elk or mule deer hunt of his lifetime. Such scenarios played out hundreds of times at February’s Great American Outdoor Show at the Pennsylvania State Farm Show Complex in Harrisburg. In the months since the show ended, just a bit doubt and a lot of second-guessing may have set in about the firearms to be used on the hunt. Sure, a Model 70 or Model 700 in every caliber from .270 to .30-06 used in the deer woods from New York to Alabama is more than up to the task. When those rifles are equipped with quality optics downing a whitetail with a single, well-placed shot out 200 yards is makeable. And no matter if pursuing game in the woods of Pennsylvania or the dark timber of Colorado, a 75-yard shot in cover presents the same challenge. While such shots are possible in the Rocky Mountains, it is far more likely elk will be encountered in open grass feeding areas called parks at distances of 200 yards or more — and expect that to be the norm if hunting the open country of Arizona and New Mexico. Those hunters who realized the need to upgrade their firearm while at the show could have put the wheels in motion to head out on their Western hunt by traveling from the Outfitter Hall to the West Hall. There they would have been able to visit the display of Montour County Custom Rifles and company founder Kevin Cram of Danville. Now in his 14th year as a master rifle builder, Cram is equally adapt at building a personalized firearm from scratch in the latest high-tech hunting calibers or build on an action from a current firearm. He is also capable of turning an off-the-rack rifle into a tack driver with his MCR Accuracy Enhancement Package. Cram will work on factory firearms that have wood, laminate, carbon fiber and fiberglass stocks, but not molded synthetic — which are in reality plastic. Because of the oil base in plastic it is difficult to stabilize the material and guarantee the work. “All factory rifles can be enhanced to perform better, and our MCR Accuracy Enhancement Package will take a factory rifle and make it perform much better than before,” Cram said. “I take as much care and pride in working on a factory rifle as I do when building a special-order custom rifle. “I begin by disassembling, cleaning and inspecting each rifle, and if a problem is found will contact the owner before completing the enhancement package. Our package includes improving the bore, free-floating the stock and tuning the trigger. Just as they had been doing for decades, the majority of deer hunters in the Danville area roamed the mountains and wood lots when targeting a buck. Cram, who graduated from Columbia-Montour Vo-Tech in 1998, chose to hunt deer in open areas and with his family took pride in their success and accuracy as long-range shooters. Cram was also interested in machine technology, and after learning the basics in high school furthered his education at Pennsylvania College of Technology in Williamsport, where he majored in automated manufacturing. After working at several machine shops in the area, he combined his profession with his passion for long-range rifles and in 2004 launched MCR, opening his shop on Jerseytown Road, west of Danville. “We were long-range shooters in my family, and I hunted with my grandfather, Don Auten,” Cram said. “He introduced me to long-range shooting and I soon became a long-range hunter. Cram’s co-worker competed in the 1,000-yard Bench Rest Club known as the Williamsport Club. This led to him purchasing a long-range rifle, which he would fine tune after working hours in the machine shop where he worked. Although Cram won a few matches, it became painfully obvious to him that for one to realize their full potential as a long-range shooter and long-range hunter a custom rifle is needed. A member of the club who built rifles as a hobby agreed to sell his equipment to Cram and MCR was launched and opened in his remodeled garage. “There is no such thing as the typical caliber because when someone orders a custom rifle it’s all over the place, but I get less than one request in a year for a rifle in .30-06,” Cram said. “I suppose the .300 Winchester Mag is among the most popular choices because it’s at home in the Pennsylvania deer woods as it is on a Western elk hunt. “If someone knows they want a custom rifle for a hunt this fall, now is when they should place their order. Building and testing the rifle is not what takes time, but depending on what the customer wants it can take six months for me to get the parts. Montour County Rifles is located at 839 Jerseytown Road, Danville; Cram can be contacted at (570) 437-2010, kevin@mcrifles.com or visit his Facebook page at www.facebook.com/Montour-County-Custom-Rifles.